The black SP5MATB 5.25" 2-Way 25/70V Speaker with Back Can from Speco Technologies is an all-in-one unit, which comes pre-assembled with back can and mounted transformer. 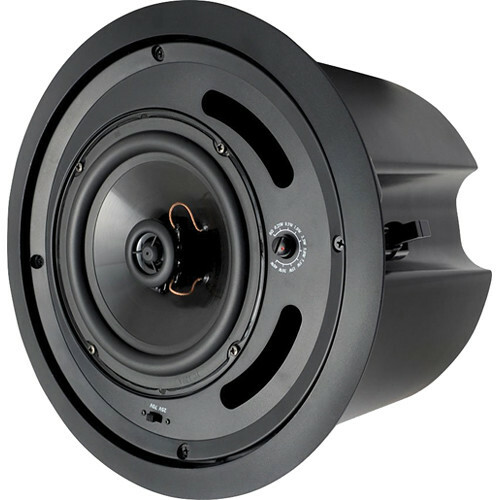 The speaker features a coaxially mounted 1" dome tweeter, and the SP5MATB has a frequency response of 57 to 20,000 Hz and will handle 30 watts of RMS power. A quick-flip 70 or 25 Volt selector switch and an easy-select transformer wattage dial are both located on the front baffle of the speaker housing. The choice of 8 individual wattage tap settings covers a full range of uses. This flame-retardant ABS unit also comes with insulated wires and has an attached metal seismic safety loop and built-in easy mount tabs for securing the unit. The SP5MATB was designed to simplify installation for contractors in a time-efficient manner. The Multi-Application (MA) Series covers a wide range of commercial applications while retaining a uniform speaker appearance. The furnished 8 Ohm tap selector also means this speaker can be kept on-hand for unexpected multi-use residential installation needs.